Here’s a few of the Highlights from Salt Lake…. I found several great Vintage Clothing/Antiques Shops. This pic is from a shop called Retro Rose. It’s located at 207 E Broadway. 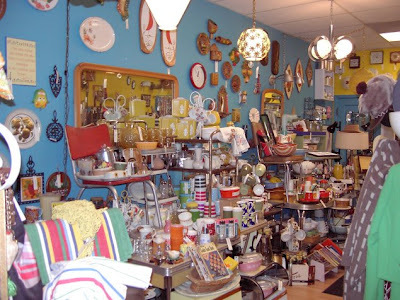 Everything in the shop was organized by color which I loved. Loads and loads of antiques painted all over the shop. I also went to a new Vintage Clothing store called Misc. (pronounced Missy) which is attached to a Vintage Mondern Furniture store called The Green Ant. I had such a great talk with Missy about how she opened her shop and owning her own business. It is so clear that having a great personality really gets you a long way as a business owner. I highly recommend her shop. She has some truly great finds ( including several great vintage bathing suits). The last shop I went to was Jitter Bug Antiques & Collectables. This small packed shop proved lucky for me. Not only did I find loads of Vintage Clip on Earrings to use for my new vintage/felted jewelry, I also found an authentic Chitty Chitty Bang Bang replica! It’s missing Potts and the Kids, but Truly Scrumptious is there waving in all her glory. This and the next few pictures are sights I saw as I strolled through Downtown on my last day in Salt Lake City. So beautiful! This Violin Making School was a definite gem. The shop windows were filled with half finished Violins. I felt like I was on one of Mr. Rogers’ field trips. No one was there, but it was clearly so full of life. Thanks Salt Lake City for a great week! Now… on to Tempe. I love your photos — the cars under the arc in downtown Salt Lake City is my favorite shot Sorry I will miss your show when you are in town — HUGS!